The Devil's Saddle, like the whole promontory of St. Elia, consists of sedimentary rocks of Miocene Epoch, and it is geologically quite young. Inside these rocks, several small caves were formed and inhabited by humans since the sixth millennium BC. The origin of the name comes from a legend, according to which the devils, fascinated by the beauty of the gulf of Cagliari, tried to seize it. Thereafter, God sent his favoured angels led by Archangel Michael, to banish Lucifer and his followers. The battle was fought in the skies over the gulf and today we still have two theories. The best known is that Lucifer, while escaping, was thrown from his horse and lost his seat that remained in the waters of the gulf and turned to stone, giving rise to the promontory. The other theory tells that ,during the battle, the demon fell on the promontory, giving to it the current form. Hence the Devil's Saddle and the Gulf of the Angels names. It is said that the angels, sent by the Almighty, are still faithful to their task and continue to protect the Gulf. Close to the highest point of the promontory (135 m above the sea level), it is supposed the presence of a Punic temple, perhaps a place of worship dedicated to Astarte. Moreover, it is also possible to admire a Punic tank, elongated, with remarkable dimensions: 27 m long and 4.5 m deep. Not far away there is another Roman cistern, from the classic shape of a truncated cone section. According to tradition, in these places, there has been the martyrdom of St. Elia, who has been killed during the persecutions of Diocletian, in the Byzantine period. The whole promontory bears his name today. In the eleventh century the whole area was given to the Victorini monks, who built a real monastery and took care of fish farms, ponds and cultivable areas in the surroundings. The tower, now almost in ruins, is situated on the highest and panoramic point of the promontory and it is to be considered, however, as a part of the defense and sighting system, created by the Spanish during the sixteenth century. However, it would seem that from the Pisan period there was a tower, known as the "Lantern", with signaling functions. Later, the same tower was also called tower of pouhet, which means catch basin, because it is situated close to the the Roman cistern. 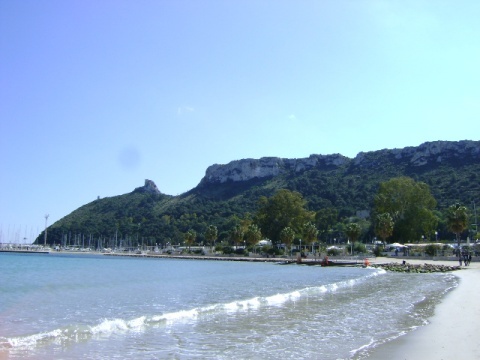 The entire area would eventually be called "pouhet", hence the name "Poetto" attributed to the large beach of Cagliari. The coastal towers continued to be used during the Savoy period, since a royal decree of 1867 stipulated that they had no longer to be considered fortified places. During the Second World War were also built a fort and other buildings, which are still visible. In all likelihood, the materials reused were from the ruins of St.Elia church, of which, unfortunately, you can only the perimeter of the foundation.